Century City is within a 5-minute walk of The Peninsula Beverly Hills while other popular sites like Rodeo Drive are within a 15-minute stroll. This 195-room, 5-star hotel has a full-service spa along with an outdoor pool and a 24-hour fitness center. There are multiple options for onsite dining with 4 restaurants, including The Belvedere, which specializes in Mediterranean cuisine and serves breakfast, brunch, lunch, and dinner, and The Roof Garden with pleasing pool views. Order from 24-hour room service to satisfy your hunger without leaving your room. Start each morning with full breakfast, available for a fee from 6:30 AM to 10:30 AM. Guests can expect to find 42-inch an LCD TV with digital channels and a DVD player, along with free WiFi and wired Internet. Pillowtop beds sport Frette Italian sheets and down comforters, and the bathroom offers a soaking tub, a hair dryer, and designer toiletries. Other standard amenities include an iPod dock, a minibar, and free newspapers. The Peninsula Beverly Hills features a full-service spa, an outdoor pool, and a 24-hour fitness center. Valet parking is USD 50.00 per night if you plan to drive, or hop aboard the airport shuttle (available 24 hours) for USD 140 per vehicle roundtrip. Multilingual staff at the front desk are standing by 24/7 to help with tours or tickets, luggage storage, and dry cleaning/laundry. Other amenities at this luxury hotel include a spa tub, a steam room, and a rooftop terrace. The Peninsula seems more like a lavish residence in Beverly Hills. Restaurant choices include fine dining at The Belvedere, afternoon tea in The Living Room, al fresco meals by the pool, light fare in The Club Bar, and full breakfast (surcharge.) The hotel features a full-service spa, an outdoor rooftop pool with views of the city, and a 24-hour fitness center. At the Peninsula Academy, guests can star in their own Hollywood movie and work with a voice coach to the stars. Activities are available upon request and reservations are required. The hotel offers a meet and greet airport service at LAX and a Mercedes or BMW sedan can transfer guests to and from the airport. A complimentary Rolls-Royce limo service is offered within a 3-mile (4.8-kilometer) radius (first come, first served), and a train station pick-up service is provided upon advance request for an extra charge. A 24-hour business center with a computer station and Internet point along with technology support staff is on site. Staff can also assist with luggage storage. Event facilities and services include 14,000 sq feet (1,301 sq meters) across 4 venue rooms, a rooftop terrace, event planning, and catering services for business meetings, weddings, and celebrations. Guests can enjoy complimentary wired and wireless Internet access in public areas. Valet parking is available (surcharge). The Peninsula Beverly Hills is a smoke-free property. 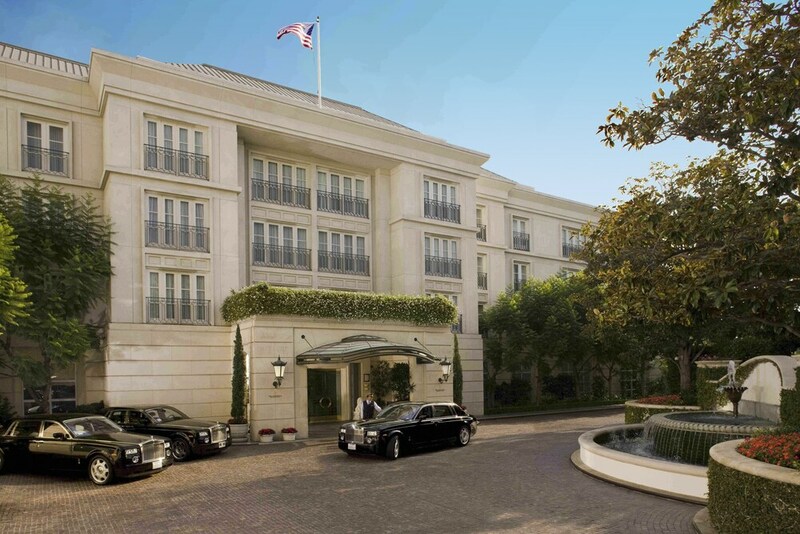 The Peninsula Beverly Hills offers 195 air-conditioned accommodations with iPod docking stations and DVD players. Pillowtop beds feature Frette Italian sheets, down comforters, and premium bedding. 42-inch LCD televisions come with premium digital channels and pay movies. Bathrooms include separate bathtubs and showers with deep soaking bathtubs, bathrobes, slippers, and designer toiletries. Guests can surf the web using the complimentary wired and wireless Internet access. Business-friendly amenities include desks and complimentary newspapers, as well as phones; free local calls are provided (restrictions may apply). Additionally, rooms include minibars and safes. In-room massages, hypo-allergenic bedding, and irons/ironing boards can be requested. A nightly turndown service is provided and housekeeping is offered daily. The Peninsula Beverly Hills offers a variety of dining options. Newly renovated, The Belvedere is a lively seafood-centric Mediterranean restaurant showcasing award-winning cuisine in a warm and inviting environment. The adjacent outdoor terrace space is a destination for al fresco dining under the glittering Beverly Hills evening sky. Open for breakfast, lunch, and dinner. Other dining options include The Roof Garden restaurant, featuring Californian cuisine in an al fresco dining environment next to the roof top pool, The Living Room, The Club Bar, and In Room Dining. With views of the city, the heated outdoor pool is located in a garden setting on the roof along with a spa tub and poolside cabanas. The fitness center includes cardio and weight-training machines and a steam room. Personal trainers are on hand to offer yoga and Pilates sessions. Located within the rooftop garden, the Peninsula Spa has 7 treatment rooms including a couple's room. Over 30 treatments include signature facials, body treatments such as body scrubs and acupuncture, and holistic and therapeutic massages including gemstone massages. The spa also has 2 indoor nail suites, and an outdoor nail cabana. For group bookings of 6 rooms or more, this property collects payment for the first night of the stay for each room at time of booking. This payment is nonrefundable. Additional policies and fees may apply. For more details, please contact the property using the information on the reservation confirmation received after booking. This property offers transfers from the airport and train station (surcharges may apply). Guests must contact the property with arrival details 24 hours prior to arrival, using the contact information on the booking confirmation. The property has connecting/adjoining rooms, which are subject to availability and can be requested by contacting the property using the number on the booking confirmation. Parking height restrictions apply. The Peninsula Beverly Hills is listed in the 2011 Condé Nast Traveler Top 100 List.